Should RDs Embrace the Term 'Natural'? While there's no consensus definition, it may be time to accept current and future product trends and get in on consumer conversations. As many dietitians know, there's no official definition for the term "natural" that everyone can agree on. The FDA defines "natural" as "nothing artificial or synthetic (including all color additives regardless of source) has been included in, or has been added to, a food that would not normally be expected to be in that food." For many, the rub is that the definition was never intended to address food production methods, such as the use of pesticides, nor does it explicitly address food processing or manufacturing methods, such as thermal technologies, pasteurization, or irradiation—nor should it be used to describe any nutritional or other health benefit.1 Consequently, three citizen petitions prompted the FDA to release a request for comments in late 2015 on the use of the term on food labels. More than 7,600 public comments were posted, yet the longstanding policy remains. Without an expert consensus definition, RDs have struggled to adopt the term. Referring to naturally occurring nutrients is generally accepted, but in the absence of a definition, "natural" remains vague and potentially misleading to many dietitians. Kim Larson, RDN, CD, CSSD, founder of Total Health in Seattle, describes the term as "too confusing" to use when speaking to clients. "['Natural'] is open to personal interpretation," she explains. "I emphasize whole food sources for nutrients and rely on a foundation of minimally processed foods." This hesitation to accept the term "natural" also may be associated with the concern that consumer definitions for the word may be contrary to health and nutrition. "'Natural' can be used as a marketing ploy to convince consumers that a food is healthier than it really is," Larson says. "'Natural' does not always mean healthier." 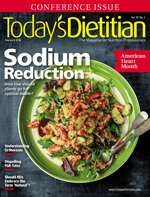 Kate Geagan, MS, RD, an award-winning dietitian, author of Go Green Get Lean: Trim Your Waistline With the Ultimate Low-Carbon Footprint Diet, and columnist for Clean Eating magazine, says, "Marketing-speak can get ahead of the science, so it's up to [RDs] to help people understand that." As an example, she says, "['Natural'] shouldn't put a health halo on nutrients that we should be limiting regardless of whether they are organic (eg, organic soda or ice cream)." Conversely, Sharon Palmer, RDN, author of The Plant-Powered Diet and Plant-Powered for Life and nutrition editor of Today's Dietitian, notes that people may needlessly fear ingredients that may actually benefit them. Such is the case with equating the term "natural" with processing. "Most Americans do not live on farms and eat all their foods fresh from the garden, thus some food processing may be necessary and helpful." Palmer notes that even foods such as pasta, bread, cereals, and canned and frozen fruits and vegetables require some amount of processing. "If all processed foods are lumped together, consumers may miss out on healthful choices and making environmentally conscious decisions. Consider food waste, food safety, preservation, and sustainability; minimally processing foods to last longer and be more available when not in season can be prohealth and proenvironment." Consider how consumers view and define the terms "health" and "healthful." As it has since the 1990s, The Hartman Group tracks consumers' perspectives and behaviors around health and wellness (H+W). In that time, they've seen a shift in consumer definitions of H+W from a rules-based, reactive paradigm to a proactive wellness culture. For consumers who are most intensely involved, proactive, and open to adopting new practices, "natural" is a H+W priority that's synonymous with whole, minimally processed, more healthful foods. Under this umbrella, many pursue a "natural lifestyle" that includes healthful alternatives that are socially and environmentally responsible. Interestingly, these consumers are more likely to associate H+W with the term "natural" and feel a connection to the environment and nature. These sentiments are more important to these folks than body weight or physical appearance, and they're less likely to associate these with health compared with the segments of consumers who are less proactive with H+W. While the definition rightfully remains elusive to many health care professionals, it may align with many of the goals and recommendations of RDs. As Palmer notes, the move to include more whole foods in ingredients lists is a positive one. "There are also new, inventive products in the natural space," she says. "Take snack bars with ingredients like fiber or fruit peels that were once considered waste. Or, pastas made of pulses, and beans in nutrition bars." She says that even well-known brands are stepping up to create more "whole food-focused ingredients, such as Kellogg's, Quaker (PepsiCo), and General Mills." As a consultant in this space, Geagan provides a perspective from the marketplace. Like Palmer and Larson, Geagan sees the value in moving toward simpler ingredients and taking a whole foods approach. What she also sees is the impact this has had on mainstream grocery stores and food companies. "If you shop the shelves of today's mainstream grocery store, you see many ideas pioneered by the natural foods industry," Geagan says. "This includes the removal of artificial colors, flavors, preservatives, and trans fats, or the newest trends in healthful ingredients and functional foods." She lists various grains like quinoa, amaranth, and millet as examples of ingredients the natural foods industry has introduced. "Consider health trends, like fermented foods and probiotics to plant-based proteins. The natural foods industry has transformed nearly every aisle of the grocery store." Sans definition, "natural" is on the minds of consumers and industry. Market data reveal a tremendous opportunity for RDs to set the course and lead the conversation with consumers. "RDs can be the experts that define this new language-roadmap with science and evidence but in a way that connects with people and meets them where they are," Geagan says. "We need to be comfortable moving forward without formal definitions or we will always be steps behind from the actual conversation our clients are having and what they're seeing in store or online. "Bottom line? At every conference I attend, I see food innovators who continue to push the language of food and nutrition forward," Geagan says. "If we are to stay relevant, we need to connect with that." • Plant power: From plant-based meat and dairy alternatives to plant-based protein options, the popularity of plants has grown. • Probiotics and fermentation: Fortified and specified, there's an impressive market for a healthy gut microbiome. • Safe, fair, and eco-friendly practices: Ingredients sourced from farms with fair practices, lower water use, and environmental benefits. • Pulses for snacking: Products made with beans, legumes, and lentils in grab-n-go bags are adding value to snacking. • DIY foods: Products that give consumers what they need to do it themselves—such as make-your-own yogurt. • Unsweetened flavor: Sparkling beverages and teas continue to innovate in flavor and variety. • Conscientious brands: Companies are aligning with environmental and community causes so profits are shared to do good. • Low-waste products: These are produced with the least amount of waste and sometimes produced from what traditionally has been considered food waste. — Jenna A. Bell, PhD, RD, is senior vice president at Pollock Communications, a food and wellness-focused firm in New York City. LabelingNutrition/ucm456090.htm. Updated November 11, 2017. Accessed November 29, 2017. 2015/01/06_14_FPD_Natural%20Report_s.pdf. Published June 2014. Accessed November 29, 2017.